Ouro Branco, Brazil was bursting with g4g science activities during the week of August 12th. 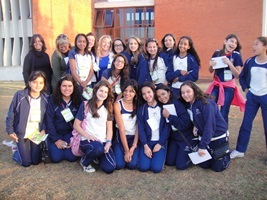 Kelly B. V. Torres Dozinel, our g4g Brazil Manager & resident astrophysicist, led an amazing array of learning events reaching girls of all ages and the community at large. The week began with a launch event at the Universidade Federal de São João Del Rei, Campus Alto Paraopeba Ouro Branco in Minas Gerais – the University has been a tremendous supporter of g4g and hosted our g4g days for the past 2 years. The g4g team in Brazil is a dedicated group of scientists, future scientists and overall STEM enthusiasts – due to all of their hard work, greenlight for girls was able to reached several local schools thus being able to engage and inspire over 350 girls. Scientists travelled from different universities and organisations in Brazil to lead workshops at our events. Over the course of the week, we held several events and the hallways were full of laughter & animation. Teaching programming using an on-line dog and cat, showing the link to astrophysics to music using guitars and pianos, robots, physics fun, engineering, games – and lots of yelling “Anything is Possible! !” – these were only some of the highlights of the week. Congratulations Kelly & team for a fabulous week! Older PostHow's working at the Brussels HQ? Jeff and Siqi our interns from Boston University Brussels give you answers.